Just like any other smartphones, the new Samsung Galaxy S5 comes packed with Bluetooth hardware that allows it to communicate with other BT devices within range. This feature allows the phone to share content wirelessly to other devices such as songs, videos, photos, etc. New technologies also allow majority of smartphones today to connect to cars infotainment systems. Now, this post is intended to Galaxy S5 owners who are still learning a thing or two about their new phones. When you pair the Samsung Galaxy S5 to other Bluetooth devices, you have to make those devices discoverable first by enabling their BT hardware. Once you've done that, turn on the BT on your phone to begin scanning. In a matter of few seconds, the phone could detect the device within range, so tap on the device and the pairing begins. Step 1: With two fingers slightly apart, swipe the top-most part of the screen down to access Quick Panel. Step 2: Touch the Bluetooth icon to turn it on. You'll know when the transmitter is on because the icon turns green. 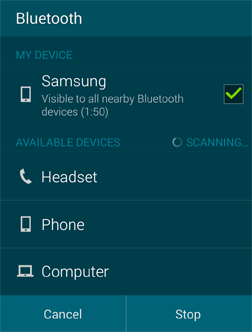 Step 3: The phone will being scanning and devices within range will be displayed under AVAILABLE DEVICES section. Step 4: Touch the device you want to pair with and enter the passkey if necessary. Step 2: Find and touch Settings. Step 4: Touch the Settings icon next to the device paired with the phone. Paired devices will remain on the list if you won't remove them. Sharing content via Bluetooth is also easy and straightforward. For example, sharing a photo via the Gallery can be done by simply selecting the file and tapping the More options icon, then Share or Share via, which gives you the option to send file via Bluetooth. If you are, however, receiving a content shared via this feature, the file will not be downloaded to your phone unless you approve it. There will be a notification telling you that "someone" wants to send a file. You can either Accept or Decline the transfer. Visibility timeout: Adjust the timeout your device uses when you set it to be visible to all nearby Bluetooth devices. Received files: Open the location where received Bluetooth files are stored. Rename device: Change the device name as it displays on the Bluetooth screen. Help: Access tutorials for your device's Bluetooth feature. I hope this post somehow helped you. Thanks for reading.